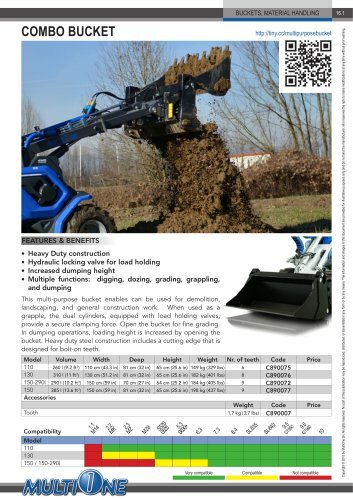 COMBO BUCKET FEATURES & BENEFITS •• Heavy Duty construction •• Hydraulic locking valve for load holding •• Increased dumping height •• Multiple functions: digging, dozing, grading, grappling, and dumping This multi-purpose bucket enables can be used for demolition, landscaping, and general construction work. When used as a grapple, the dual cylinders, equipped with load holding valves, provide a secure clamping force. Open the bucket for fine grading. In dumping operations, loading height is increased by opening the bucket. Heavy duty steel construction includes a cutting edge that is designed for bolt-on teeth. 16.1 Copyright © 2015 by MultiOne Srl. All rights reserved. No part of this publication may be reproduced, distributed, or transmitted in any form or by any means. The information and images in this document are provided for illustrative purposes only and do not bind the manufacturer, who reserves the right to make modifications at any time without prior warning.